A low-end collecting staple for the NFL, 2016 Score Football keeps things simple. However, a new jumbo format brings the price up a bit with four hits per box, including three autographs and one memorabilia card. 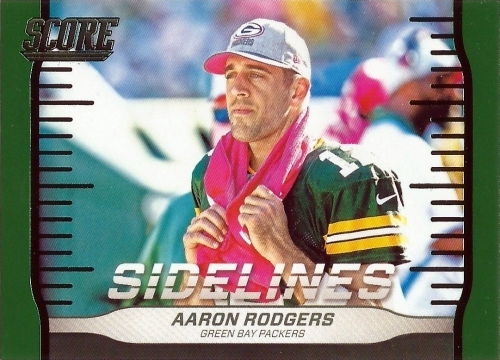 Providing a detailed look at the league, the base set totals 440 cards. In addition to 330 veterans, the 110 rookies are the first officially licensed options from the 2016 NFL Draft class. 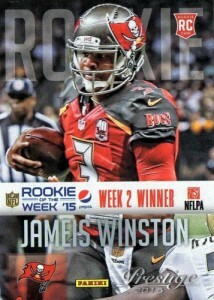 Rookie cards fall six per jumbo pack. Base Parallels combine to average two per jumbo pack and include one-of-one Gem Masters. Printing Plates are a case hit. 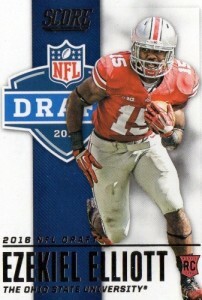 Rookie Signatures cover top 2016 NFL Draft names and are enhanced with Scorecard, Showcase, Gold Zone, Artist’s Proof, Red Zone, First Down, End Zone, Gem Masters and Printing Plates parallels. 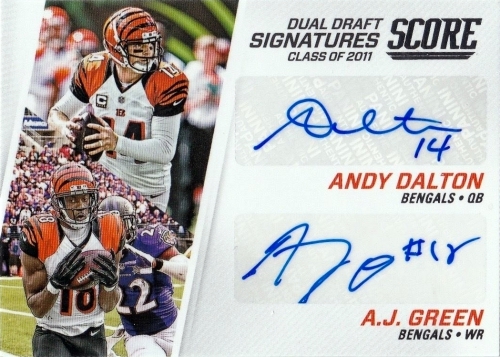 Other signed cards include Dual Draft Signatures that showcase top names found in the same draft class over the past eight years and Inscriptions for current greats and young stars. Adding to the hits are multiple relic inserts. 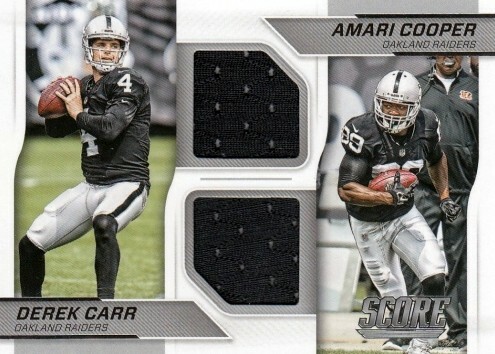 Dual Jersey, Triple Jersey and Quad Jersey teammate cards are joined by Prime patch parallels (#/10 or less) as well as Team Eights and one-of-one Patches. 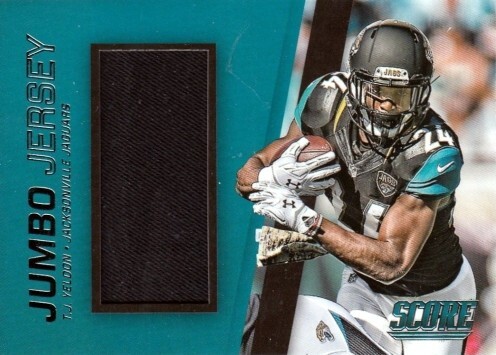 Jumbo Jerseys feature top young players while Helmet cards include woven commemorative relic pieces for veterans and rookies and are exclusive to retail blasters at one per box. Basic inserts include All-Americans that highlight recent players to earn the collegiate designation. 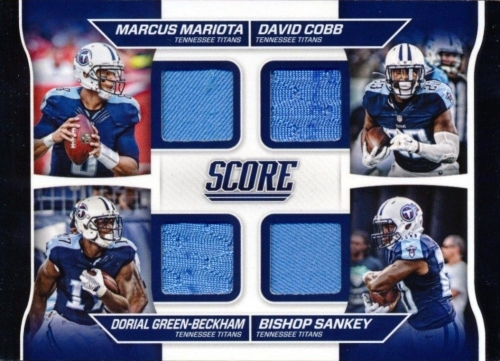 Other inserts include No-Fly Zone that focus on the best defensive backs and Signal Callers that celebrate top QBs. There are Red, Green and Black parallels as well as an exclusive Gold (#'d) version only found in Jumbo packs. 440 cards. Shop for base sets on eBay. PARALLEL CARDS: Scorecard, Showcase #/99, Gold Zone #/50, Artist’s Proof #/35, Red Zone #/20, First Down #/10, End Zone #/6, Gem Masters 1/1, Printing Plates (Black, Cyan, Magenta, Yellow) 1/1. 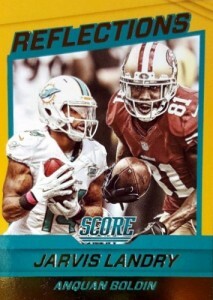 JUMBO PARALLEL CARDS: Gold Zone #/99, Artist’s Proof #/50, Red Zone #/35, First Down #/10, End Zone 1/1. 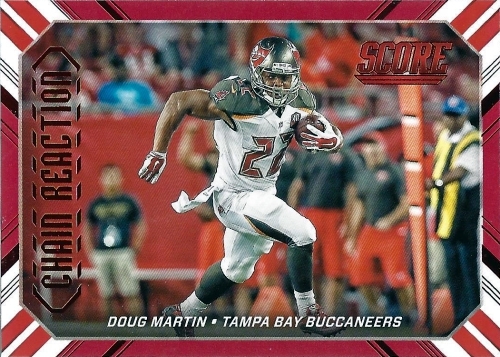 PARALLEL CARDS: Scorecard, Showcase #/99 or less, Gold Zone #/50 or less, Artist’s Proof #/35 or less, Red Zone #/20, First Down #/10, End Zone #/6, Gem Masters 1/1, Printing Plates 1/1. 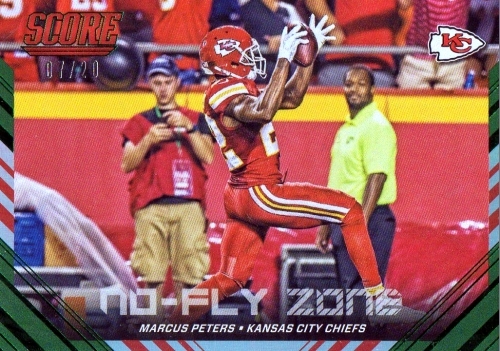 JUMBO PARALLEL CARDS: Gold Zone #/99 or less, Artist’s Proof #/50 or less, Red Zone #/35 or less, First Down #/10 or less, End Zone 1/1. PARALLEL CARDS: Black, Gold, Green, Red. JUMBO PARALLEL CARDS: Gold #/99, Red #/50, Green #/20, Black 1/1. PARALLEL CARDS: Prime #/10 or less. View specific options with the full spreadsheet. The very first of 35 releases? or more? Let the onslaught, dilution of product begin. The draft isn’t until April 28th to 30th. Rookies wouldn’t have NFL team logos, just college. Release date is to soon , cards overall are decent, I like how there are parallels for each card like artist proofs,scorecard and so on. But hard to get over a release date in April. 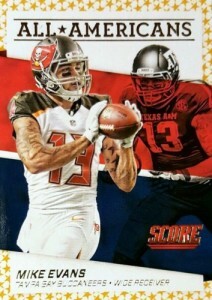 Someone at Panini has taken over this product and has devoted alot of time to it. The past couple of years it’s been getting alot better. No more of the $1 a pack fire starter stuff it use to be. Now it has some good design and great photos. Early autos before the players start forgetting how to write their name. One of the best early box values. Just the $95 price tag for the odds of 109 RC autos checklist is little too steep. Wait for the $40 on Black Friday deals. Have to agree with negative reviews. 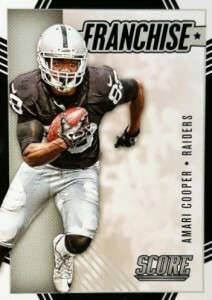 Panini/Score gets exclusive rights to market NFL cards and what do they do? Rush out a so-so product in April. 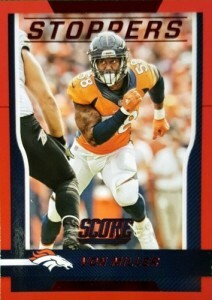 Action shots decent, but not great, no team leaders cards, no retro designs or classic players (like Topps did), no rookies in pro uniforms, etc. And the entire set feels outdated. For instance, they placed a retired Calvin Johnson as the Lions’ “Franchise” player. 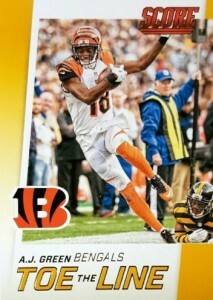 I’ve liked Panini/Score football cards in recent years, but I think they rushed out an unexciting product in 2016. I think this is an overall nice product especially for a low end set. The insert sets are nice and have something for everyone. The simple design is actually nice and allows the focus to be on the photo, and there are some nice photos with some very lifelike contrast making the action jump out a little. Overall a nice low end set with something for everyone. I just got back into collecting and really like this set. It’s been fun trying to collect the base set. Sports cards are not like they used to be. I’d say for the price point these are great. As a College collector, I appreciate a nice variety of new cards and parallels for my PC. 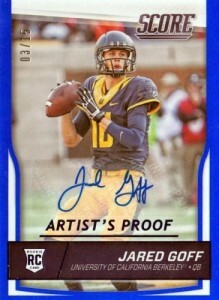 I do not like however when they mix Pro and College cards in one product. This makes it harder to get what I want out of a group break. I also do not understand the retail/jumbo thing. Are there 2 versions of every card with some having different numbering? Chris � There several parallels of the base set, but certain types are only found in retail packs and the others are only found in Jumbo Hobby packs. Target was selling 52 card packs for $4.99 and I went out and bought every pack on the shelf and with the help of ebay put together a complete set. It might have cost me more in the long run but it was fun. It was the first set I tried to put together from retail since 1990-91 Fleer Basketball. I have been collecting for more than 45 years and thought this might be the last time I will ever see cards going for less than 10 cents. The design is smooth and simple a lot of different checklist players. This was just some OLD TIME COLLECTING. Pretty decent set for low end. My biggest beef here is I have no idea the relative scarcity/value of the parallels that are not numbered. Any info on that? 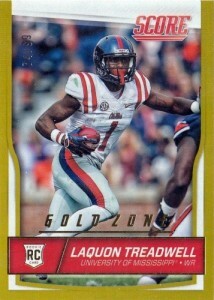 For example, are gold parallels scarcer than green? For 5 bucks, the cards are made of decent stock, the parallels are nice and the inserts really pop. For a lower end set I would definitely recommend it. 52 card pack guarantees you some rookies and nice inserts, and the 20 dollar boxes you’ll almost always get a memorabilia piece out of. Just started collecting cards again and I really like this set. Lots of interesting insert cards and the quality of card is pretty good. Look forward to trying to complete the entire set. A lot of collecting the base set from wall mart. I didn’think know about all the parallels and sub sets. It’s gonna be fun collecting those. 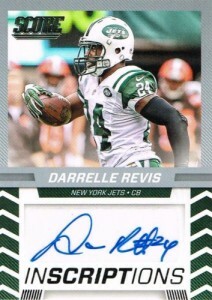 Does anyone know how many rookie card signatures there are in the set? 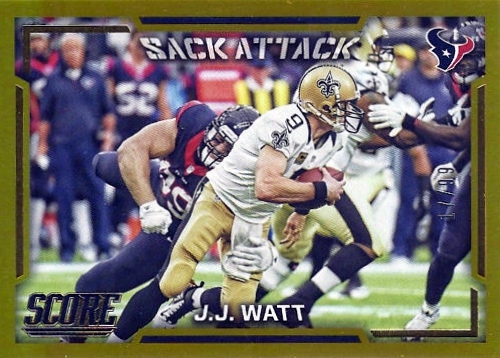 Pretty good for low end product, is it just me or can no-one find the JJ Watt base card?